Promotion: Cabinets order over $1000, buy 1 box Backsplash Tiles Get 1 box FREE. I am sending you a picture… very pleased with the result. Want to thank you for sending on the replacements… Thanks again, for all of your patient help. You were very professional throughout the process. The cabinets are mostly up and they look great! We will definitely be ordering from you again for the next house we renovate - I found the process (with your help) very easy, the delivery was speedy and the quality is great. I've gotten many complements on the cabinets, they went together easily and look great. I received my order yesterday afternoon. Once again, I'm very impressed by the quality of the cabinets, timeliness of the delivery, and excellence in customer service. Great job. Order has been placed and received. The cabinets look great and I will be sure to recommend you in the future. I just wanted to write you a note to tell you what a wonderful job Mike Sinay and his crew did on our kitchen cabinets. We purchased an older home 3 wks prior to our wedding date, and needed to make an entire kitchen renovation to prepare for a Home ceremony. Understanding our timeline, Mike and crew were courteous, professional worked many late evenings to get the job done right and on time. I understand Mike even worked late on a Friday night off the clock to install some frosted glass on the cabinet doors. As you can see from the picture attached, they did a great job. Everyone loved the kitchen. Mike is a great asset to your company and I would recommend his work and products anytime. Thanks for all of your help. You've definitely made the cabinet shopping process a whole lot easier, especially since I purchasing them remotely (i.e. no showroom) and the fact that it is a bigger money purchase compared to my typical online transactions. I really appreciate it. I ordered a new Kitchen last year, which I love! Thanks for the service. It's obvious that your a pro. Thanks! Kitchen is great, I am sending a good recommendation to other people, you should have a few of them on in the near future. I will send you a picture of the finished product, thanks again for the help. They had so much wasted space in the old kitchen and now I have a wonderful new kitchen WITH a wonderfully large pantry attached!!!! Jeff, Thank you for all of your hard work and professionalism. The cabinets look very nice. I tell everyone about your cabinets and of the quality and low prices. I will also be ordering additional Cabinets soon. I thought I would let you know that our kitchen looks great with the new cabinets. It's really coming together nice. I would also like to thank you [Marci], Angie and Bill (Sr and Jr) for the great service and all of your help. Thank you so much Angie. It has been a pleasure dealing with your company. I just wanted to let you know that I finally got the cabinets yesterday due to the snowstorm. They are beautiful and my brother is putting them together as we speak. I was really nervous about ordering them online and especially since I found you guys and not my brother, so thanks again for all of your patience and help! I will be sure to recommend you guys to friends and family. Great Job on the Cabinet & Granite install !!! Bub we appreciated you staying till 12 midnight to finish the job correctly. You took your time and did the job right, the wood working and miter cuts were done perfect !! Thanks for your help. We have assembled 2 of the cabinets. They are easy to assemble and look great. the cabinets went together great and look spectacular! I really appreciate you guys and your products! I can't believe how superb the crown molding makes the cabinets look...I absolutely LOVE them!!!! I can't help walking into the kitchen to just look at them...hehe. When they are finished I will send you several pics of them from different angles. While Dave is doing the crown molding, I am staining around the windows FINALLY! It is finally starting to come together and I couldn't be more happy! I just wish there was a way that more people would find out about these cabinets. The only way I did was searching the Internet but not one person who has come over to my house has left without commenting on how great they look and always asks me where I got them. I think you guys should advertise more but then that would probably drive the cost up a bit more too and the price is what helps make them so great!! The kitchen looks good and my wife and I are pleased with our purchase. Your layout and detail are amazing! I am so happy I found you guys!!! Also wanted to let you know that we really love these cabinets! I am still in the process of putting together but they are top quality and will look beautiful when done. What a value, we have been telling everyone about them. I really appreciate the customer support I've received through the ordering process. I'm looking forward to the next phase of the project! By the way. I love the cabinets so much that I gave the website to two other people. :) So, you can probably expect to be delivering even more in Florida. I like the fact that you have walnut and your within 40% of the other 2 quotes using maple. Your also the only brand I found a good referral for cheap quality import cabinets. We received our cabinets and they were even better than I could imagine. I love them! Thank you for such a great product. Thank you Tracy. It has really been a pleasure working with you and our cabinets look absolutely amazing! I am an architect and have done numerous kitchens throughout my career. The Richmond cabinets I just purchased are some of the absolute best cabinets out there. The finish quality, the ease of assembly, the incredibly fine drawer glide systems, all of it is the best. Thrilled with the purchase, thank you. Thanks for all your assistance! The cabinets look great in the remodeled kitchen!! I'll sent a picture or 2 when completed! Firstly let me say how great my cabinets are!! I am doing a 50's style diner in my kitchen and they work perfect! We've got all the uppers installed and I am quite likely sending 2-3 customers your way because of how great they are and how great I have talked up the process and your company! We love the cabinets! I've been doing home construction for almost 40yrs and have never installed such good quality cabinets. They were very easy to assemble and will definitely recommend these to my customers. Thanks for your help in making the process an easy one. Thank You for the help. I really like the cabinets and feel like I got a bargain. I'll recommend you to anyone I know needing cabinets. I certainly will! Thank you so much, I cant wait to get all the cabinets together and installed, almost finished! I knew I got a good deal BUT WOW - they are better than I imagined!!! THANKS SO MUCH! I wanted to thanks for an amazing experience. Everyone has been so wonderful and helpful in this process. From the placing of the order to the fast prompt shipping . They were easy to put together and install. My father is a builder, he was so impressed with the quality and affordable cost that he bought 3 full kitchens for his current work projects.. I wanted to share a few photos of my new cabinets.. I would be happy to send you photos of the kitchen when it is 100% complete for your website. The cabinets are just beautiful. We could not be more pleased with the quality and design. They are exactly what I wanted. People that come to check our progress are always blown away with the value and how nice they are. We have made several referrals to you with family on the east coast, friends on the west coast and, of course, friends and family here in Tucson. I hope they come thru for you. I have been trying to find mobile home replacement cabinets. I was able to locate some at your web site. When I called to get additional information Randy answered the phone. I work with the public and hold people to a very high standard for customer service. Randy exceeded them! He was professional, polite, and helpful. He put my mind at ease, provided me his cell phone number for further questions, and really made your company stand out! Thank you Randy, for a gret job!!! thank you for the great service Don have been providing me and my customer Mr. Lopez. You're welcome. Aneta already referred your company to one of her close friends in NY who is considering redoing their kitchen. 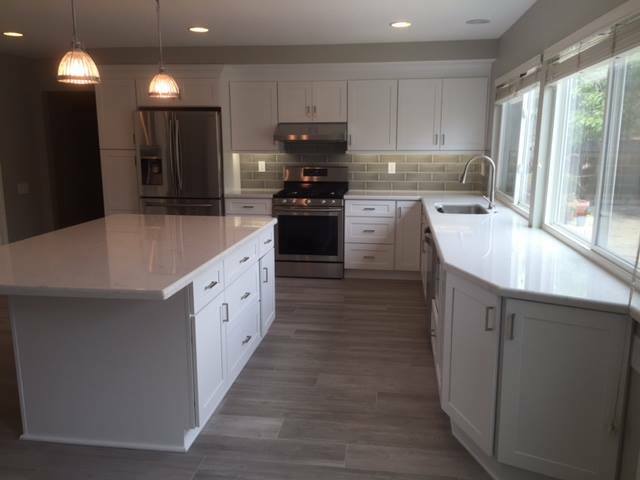 Her and her husband haven't made a final decision whether or not they will tackle this project now or in the future, but Aneta gave kudos on the quality of your cabinets and caring customer service. I will also recommend your cabinets to anyone I come across who needs to redo their kitchen. We love our cabinets and get rave comments from our guests! I'd also like to add that even with the mix up, your product looks great and the customer service is unmatched. As house flippers, we will definitely be ordering from you guys again. Thanks for all of your help. I also ordered some more cabinets and trim from your company . Thanks so much for everything. Your products and customer service are top shelf! Thanks for all of your help and efficiency. Great Customer Service! We have purchased your cabinets twice, once for a house and once for an apartment, and have been very please with the quality. We would not hesitate to use them again. I want to thank you for all you have done to get these great looking cabinets. Other than the shipping mistakes that happened I cannot be happier with the cabinets. My wife and I put them together in a couple of hours. I am posting them on my facebook page and I will recommend you and the company for all my friends and family. I am very sorry for any problems I might have caused anyone. I have also enclosed pictures of them , also so you know I was telling the truth about ground zero a picture for you. Thank you again. Chuck was an incredible help. His responsiveness, knowledge and prompt service are the reason we selected this company to purchase from. Thanks Chuck! It has been a pleasure working with you for the remodeling of our kitchen. Your expertise and professionalism in the layout design was outstanding. 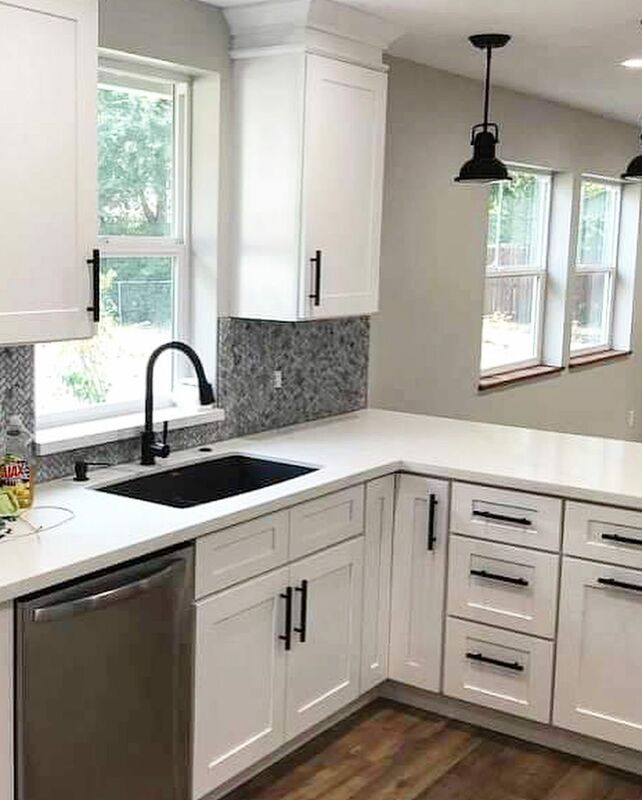 Except for the granite countertops, the entire project, including destruction of the old kitchen, assembly and installation of the cabinets was completed by my son-in-law and me. The quality of the cabinets is outstanding and the cost is well below completive products. The cabinets were all easy to assemble, exceptionally sturdy and custom like. The self-closing drawers and roll-out shelves are well worth the cost. Again, thank you for your assistance and attention to detail. I must say, I LOVE my new cabinets! The quality is great, and although I didn't realize they were RTA (obviously didn't read very far on first page! ), our cabinet guy figured the assembly out and got them all together. My experience with my contact, Jonathan was great. He was patient with my many questions, and always got answers for me. It was so refreshing to work with someone who followed through and got back to me quickly. He also offered some ideas to help me solve an issue with my more unconventional design :) so that was greatly appreciated. I'd highly recommend working with him if you have the chance. We're hoping to have done our last kitchen redesign..but in the even we would need to do it again, I'd be calling Jonathan again. Thanks for your great product and great service. I've chatted several times today and everyone has been great! better help and more knowledgeable than the people are actual shops. Fast response too! Thank you for your attention to the cabinet, it's perfect! This is exactly the information I was looking for. My husband and I are working to update our kitchen. I love your site and your quick response. I thought I would share my before and after photos of my basement wet bar redo. While I had to make an investment in clamps & nailers, it was ultimately fun to put together from your Pro Series. Jonathon worked with me on designing the overhead cabinets, which ended up with me taking a extra wine cabinet and cutting it in half to get the two open nooks on each side of the wine cabinet that was used. We still need to tile the backsplash, but other than that it is done. My wife and I wanted to take a moment of your time in an effort to provide you with feedback regarding our experience with one of your employee's, Mr. Chen. We are in the process of renovating our kitchen and contacted your company last month in order to seek a design and estimate for kitchen cabinets. Since we have never done anything like this, we needed a lot of help, He has provided us with samples as well as various designs that he thought would work in our kitchen. Mr. Chen has been most professional and extremely patient during the process, and we just wanted to tell you how pleased we are with his help and expertise. We decided this evening on the design as well as the material, and now waiting for Mr. Chen to provide us with a price estimate. Please convey to Mr. Chen our thanks and appreciation for his excellent help, professionalism and expertise. John you were very helpful in our planning and ordering. It was a pleasure to do business with you. Chen was patient, professional, and very helpful. Thank you. We received all the cabinets and are mighty impressed with how easy they were to assemble and how beautiful they look. With a Full –Time Job and 2 kids – I assembled one cabinet a night until they were all done. The cabinets we bought were intended to extend the life of a kitchen that will "someday" be changed completely. We are not concerned that the cabinets don't match perfectly - we wish all of the cabinets were the color , we like them better. But we were very satisfied with how easy they were to assemble and we are accomplished enough do-it-yourselfers that installing them was easy as well. Thank you - and we look forward to working with you in the future - albeit a distant one! This email is being sent to acknowledge the great customer service we received from your representative, Jonathan. From the beginning of our conversation with Jonathan, we realized his knowledge of the product. He helped us determine what cabinets were needed, the selection, floor plan, ordering, and explained the assembly of the cabinets and directed us to the video on your website. We are now anxiously awaiting the arrival of our new cabinets, and depending on the quality of the product and the amount of time required in their assembly, we will definately recommend your cabinets to others. I just completed my order of cabinets I ordered for a kitchen island and pantry. I’m so pleased with how everything looks. Anxiously waiting to get the countertops done, but have to save a little more $. The cabinets are so pretty I want to complete them with quartz. I want express how pleased I'm not only with my cabinets and how you stool behind the issues we encountered, We had the best sales rep., he did a wonderful job helping me with the layout, see that my order was sent out, he's kindness and helpfulness in handling all the problems we had, seeing that replacements were sent out very quickly. And then seeing we got a refund. "Very impressed " I thought for sure we would get a big run around, not at all one call and we received a check in week. It was scary placing a order this large "on line” even after reading all the quality specs, we kept thinking there had to be a loop hole somewhere with price being such a bargain " I'm a true shopper and do a lot of comparing" With other competitors. If you wanted plywood, and soft closing drawers glides it's an upgrades, and their prices were much higher even without these upgrades. Even the shipping company was very polite and helpful We won't hesitate to buy from you again or refer them to our friends Thank you for your honesties in your product and service. I am pleased with the way the cabinets turned out. Good quality and great price! Thanks Chuck, hope you enjoy the pictures. I'm writing regarding the purchase of my Kitchen Cabinets through your website. Shortly after ordering some samples I was contacted by Jonathan. He asked questions about my project and became an important part of the design process. The services he provided were way beyond my expectations! The advice and final design were right on, it was hard to believe I could get that level of service from an online company. If it wasn't for Jonathan I may have purchased cabinets elsewhere! The cabinets are installed! Our granite was put in last Friday and today the plumber is installing our sink, dishwasher, and garbage disposal. I'll be happy to take some pictures and send them your way! I received an email not to long ago asking us to complete a survey. Unfortunately, I cannot find that email. Is it possible to have it resent? We would love to leave some good testimonials for you. Every contractor that has been in our house (electrician, granite guys, plumber) since we finished installing the cabinets has been very complimentary of the cabinets. They all said the quality was great and they looked fantastic. A few asked for the name of your company which we gladly passed along. We will be working on details over the next few weeks and I may be back online to order some extra molding if necessary. Thanks for everything! We LOVE the way our kitchen looks!! Thank you so much for making sure this order was accurate. They are gorgeous and high quality.. WOW.. They arrived with no damage - one had a little indentation where one of the straps pushed in on it, but that is a packing thing, really. No damage with SpanAlaska. So far, Todd's been building them, and it's going smoothly. We're about halfway assembled and calling the plumber and electrician for next week. I'll send you a photo for the website once we finish... Thanks Again! We'll recommend you in the future... Take care! 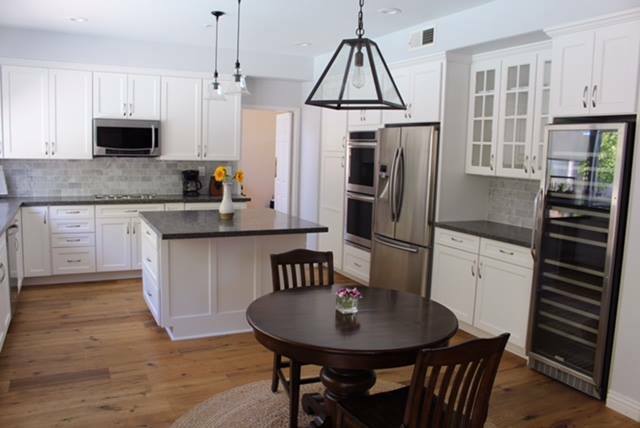 We purchased shaker white kitchen cabinets and I am so impressed at the quality for the price. I went to Menard's to purchase cabinets for our rental house, but the quality was so poor I just couldn't buy them. I asked my wife to see if she could look online and find something of better quality. Minimally a cabinet not build out of particle board. I am so glad she found you all, I really like the dove-tailed drawers and the bracket system for installation. Thanks for making our rental look nice !! Thank You so much for helping with this order, and your company is great. Copyright © 2019 KitchenCabinetMall.com All Rights Reserved.